Our staff here at our South Indianapolis and West Indianapolis locations of Dr. David Bax Injury and Rehabilitation Center is glad to welcome all new and existing patients to the "About Us" area of the new site! Our staff is currently comprised of our chiropractor, our massage therapist, our office manager, and our wellness support staff. Each of our staff members may be found at either Indianapolis location on any given day, and it is our aim to make sure that every patient who comes through the doors of our offices rates our care as top n otch. Our chiropractor is Dr. David Bax, who also owns and directs the two Centers. Dr. Bax has obtained considerable experience throughout his career working as a licensed chiropractor. Dr. Bax has been helping chiropractic patients with a number of conditions over the years. From fibromyalgia to sciatica to allergies and carpal tunnel, Dr. Bax can treat many types of bodily aches and pains or chronic conditions with chiropractic care. The philosophy that Dr. Bax follows is one of whole health. Treating one problem at a time, and handling medical problems only when emergencies happen, is not the way to achieve wellness. By treating the body as a whole, Dr. Bax and our staff will help patients to get to true wellness. Our massage therapist, Kristina, has been helping our patients to achieve pain relief with therapy for about three years. 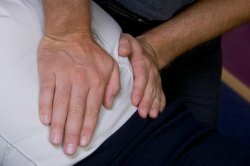 When this type of gentle therapy is used along with other chiropractic treatments like spinal adjustments, physical therapy, cold laser therapy, and lifestyle changes such as improved nutrition and a regular physical fitness program, our patients often experience complete pain relief, and may even feel better than ever. Our additional office staff includes Lisa, our office manager who is always available to answer inquires about the types of treatments we do here. Jake and Natasha assist Dr. Bax and Kristina with treatments when needed and are always available to help Lisa with patient care. Whether our patients are here forphysical therapy, cold laser therapy, nutrition, or spinal care treatments such as gentle spinal alignment, our staff is ready to help. Patients who suffer from the pain of fibromyalgia, sciatica, arthritis, sports injuries, or any chronic or sudden pain know how frustrating and hard that it can really be to live with pain. Our staff is here to ease your suffering, and more than that, to help you enhance the overall quality of your life. Since our two offices are total health centers, we make it our pledge to you, the patient, that we will do everything we can to help you to achieve the health that you deserve. If you have any questions about our procedures, treatments, or our health philosophy, please feel free to talk to our staff -- We are always here for you at the Dr. David Bax Injury and Rehabilitation Centers. Call us at 317-291-7246.